This second, revised and enlarged edition looks back at the aspirations and struggle of the marginalised Dalit masses and looks forward to a new humanity based on equality, social justice and human dignity. Within the context of Dalit emancipation, it explores the social, economic and cultural content of Dalit transformation in modern India. These articles, by some of the foremost researchers in the field, are presented in four parts:Part I deals with the historical material on the origin and development of untouchability in Indian civilisation. Part II contests mainstream explanations and shows that the Dalit vision of Indian society is different from that of the upper castes. Part III offers a critique of the Sanskritic perspective of traditional Indian society, and fieldwork-based portraits of the Hinduisation of Adivasis in Gujarat, Dalit patriarchy in Maharashtra and Dalit power politics in Uttar Pradesh. 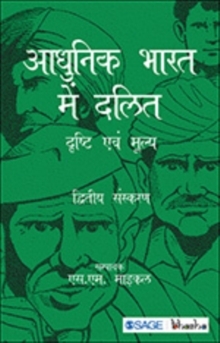 Part IV concentrates on the economic condition of the Dalits.